Tokyo, December 14, 2012 - Fuji Heavy Industries Ltd. (FHI), the maker of Subaru automobiles, today announced that Ward's AutoWorld, a monthly automotive industry magazine for professionals worldwide, has named Subaru's "FA20" 2.0-liter 4-cylinder horizontally-opposed Boxer engine of the Subaru BRZ sports coupe a winner of its 2013 Ward's "10 Best Engines" award. This is the 3rd win of Ward's prestigious "10 Best Engines" accolade for Subaru, its first being the 2004 award and second being the 2010 award both with the Subaru "EJ25" 2.5-liter turbocharged Boxer engine. 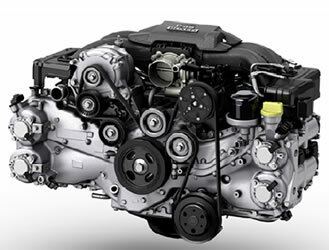 The "FA20" is a compact, lightweight and low-center-of-gravity engine specially developed for the Subaru BRZ to realize the vehicle's ultra-low center of gravity packaging which delivers excellent handling performance. The "FA20" is designed with a completely square bore and stroke of 86 x 86 mm offering the exhilarating high-revving up to the rpm limit and the optimal combination with Toyota's "4-DS" direct injection and port injection technology provides excellent environmental friendliness as well as superior output of 100 ps per liter achieved with a naturally aspired engine. The judges composed of WardsAuto editors recognized that the vehicle comes well equipped for about US$25,000. Ten WardsAuto editors chose the winners from among 40 new or significantly upgraded engines based on power, technology, observed fuel economy, relative competitiveness and noise, vibration harshness characteristics. To be eligible, each engine must be available in a regular-production U.S.-specification model on sale no later than first quarter 2013, in a vehicle with a base price below $55,000.